Causes Of Indoor Air Quality Problems | H & H Commercial Services, Inc. Causes Of Indoor Air Quality Problems | H & H Commercial Services, Inc. Concerned indoor air quality (IAQ) issues are effecting your business? 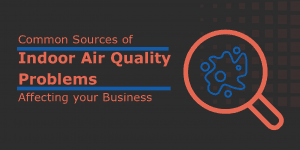 Commercial HVAC service companies hear a lot about air quality in the workplace these days, with employees frequently speculating as to whether the indoor environment in which they spend so much of their time is effecting their health. Health related complaints pointing a finger at poor indoor air quality typically mimic cold and flu symptoms: Sinus issues, congestion, sneezing, throat or eye irritation, headaches, dizziness, fatigue, nausea, and even asthma flare-ups. These should be of particular concern when shared among multiple employees. Dust accumulates from a variety of sources, and is easily distributed by commercial heating and air conditioning systems when filters are left filthy and not routinely replaced. This is commonly a cause of HVAC system malfunction, and uncovered when the commercial HVAC repair contractor troubleshoots system issues. Dragged in on shoes and clothes from outdoors, or in the case of dander, employee homes, these contaminants can also be distributed via dirty HVAC filters and duct work. Dirt/debris buildup in duct work, coupled with poor humidity control, inadequate ventilation, as well as hidden leaks in building structure and plumbing, can all quickly lead to dangerous mold proliferation. Airborne viruses/bacteria have been shown to distribute more easily in poorly ventilated buildings, including Legionella, a potentially deadly bacteria associated with the stagnant warm water of poorly maintained systems. Infestation of system components by disease and allergy inducing rodents, roaches, etc. can cause a host of health issues. Cleansers, pesticides, printers, furnishings, tobacco smoke, fragrances/cosmetics, exhaust fumes from combustion appliances (carbon monoxide), and more can emit harmful vapors/VOCs that negatively affect occupant health. Upgrading to a HEPA filtration system, incorporated into your current HVAC system alongside a UV light air purifier, can filter out a wider range of contaminants than the average filter. True HEPA filters, denoted by a MERV rating of 17-19, remove 99.97% (or more) of airborne particulates, greatly improving IAQ. Good building ventilation design and proper exhaust is essential to safeguarding indoor air quality. Regular inspection of ducts can quickly identify and address mold proliferation and pest infestation issues that negatively impact health. The addition of a dehumidifier can thwart moisture-related issues, including mold, bacteria, and dust mite proliferation, as well as improve employee comfort, keeping humidity levels in check (30-50% RH). Regular professional inspection and maintenance of all system components is essential to ensuring proper system function, a building free of contaminants, and good indoor air quality. Ensure productivity with a work environment that is healthy and safe. Address indoor air quality issues promptly with the help of the best commercial HVAC company in New Jersey. Contact H&H Commercial Services today.